Y’all. 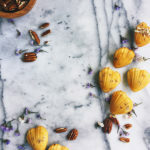 I feel like all of my favorite bloggers are coming out with cookbooks this fall! 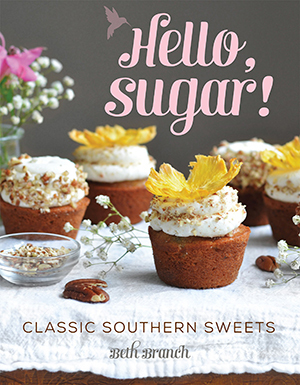 Last year I was extremely excited to hear that Lindsay of Life, Love, and Sugar, one of my favorite baking blogs ever, was creating a book. And it’s finally here! Today is release day! It is only fitting to celebrate the best way we dessert bloggers know how. I’ve always admired Lindsay’s perfectly frosted and decorated cakes. 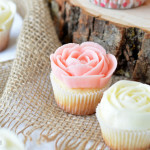 So in addition to about a million delicious cake recipes that I’d like to personally stuff in my face, Simply Beautiful Homemade Cakes also covers decorating, from tips and tricks to tools used. I’m always interested to see how other bakers go about creating their cakes, and this section of the book is full of wonderful tips! When it came to deciding which cake to make first, there was really no question. The Cinnamon Roll Layer Cake. 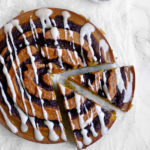 I know I *just* posted a this Pumpkin Cinnamon Roll Cake, but I can’t help it. 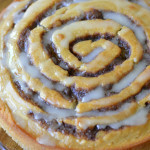 I just crave cinnamon things in the fall! This cake is alllllll cinnamon everything! 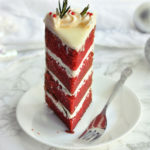 The cake is cinnamon, there’s a cinnamon glaze that soaks into the top of each cake layer, and the frosting is cinnamon. It’s a cinnamon-lover’s dream come true, really. I did two things slightly differently than the recipe in the book. One of my coworkers received some new spices and seasoning blends from McCormick, and brought them into work for us to try. The package included *roasted* ground cinnamon, so I snatched that up fairly quickly. 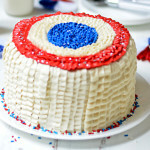 I’m not sure if it’s available in most grocery stores, but it really amps up the flavor in this cake! The second thing was adding the cinnamon ganache. I had some cinnamon chips on hand, and decided to melt them with some cream to create a drizzle since I’m still stuck on the drip cake bandwagon. Feel free to leave it off, but if you’re as cinnamon-obsessed as I am, you’ll love it! 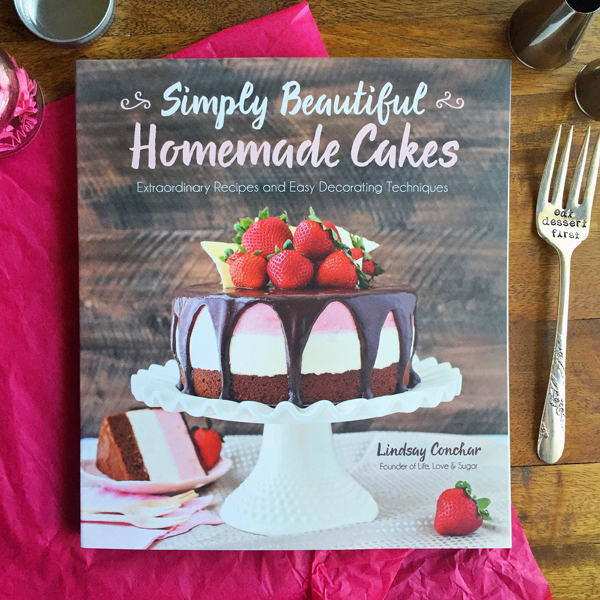 Get your copy of Simply Beautiful Homemade Cakes! Preheat the oven to 350°F (176°C). Line the bottom of 3 (8-inch [20-cm]) cake pans with parchment paper and grease the sides. In a large mixer bowl, cream the butter and sugar together on medium speed until light in color and fluffy, 3 to 4 minutes. Add the sour cream and vanilla extract and mix until combined. Add 3 of the egg whites and mix until well combined. Add the remaining 3 egg whites and mix until well combined. Scrape down the sides of the bowl as needed to make sure everything is combined. Combine the flour, baking powder, cinnamon and salt in a medium bowl. Combine the milk and water in a small measuring cup. Add half of the flour mixture to the batter and mix until combined. Add the milk mixture to the batter and mix until combined. Add the remaining half of the flour mixture and mix until smooth. Scrape down the sides of the bowl as needed to ensure everything is well combined. Divide the batter evenly between the prepared cake pans. Bake the cakes for 23 to minutes, or until a toothpick inserted in the middle comes out with a few crumbs. Remove the cakes from the oven and allow them to cool for 2 to 3 minutes, then remove them from the pans and transfer them to a cooling rack to finish cooling. To make the frosting, beat the butter and shortening together until smooth. Slowly add cups (690 g) of the powdered sugar and mix until smooth. Add the vanilla extract, ground cinnamon and water or milk and mix until smooth. Slowly add remaining 6 cups (690 g) powdered sugar and mix until smooth. Set the frosting aside. To make the glaze, add the powdered sugar, brown sugar and cinnamon to a small bowl and whisk to combine. Add the water and whisk until smooth. Combine cinnamon chips and cream in a small saucepan over medium heat. Stir continuously until cinnamon chips melt and mixture is smooth. Remove from heat and allow to cool completely. To put the cake together, use a large serrated knife to remove the domes from the tops of the cakes so that they’re flat. Place the first cake on a serving plate or a cardboard cake round. 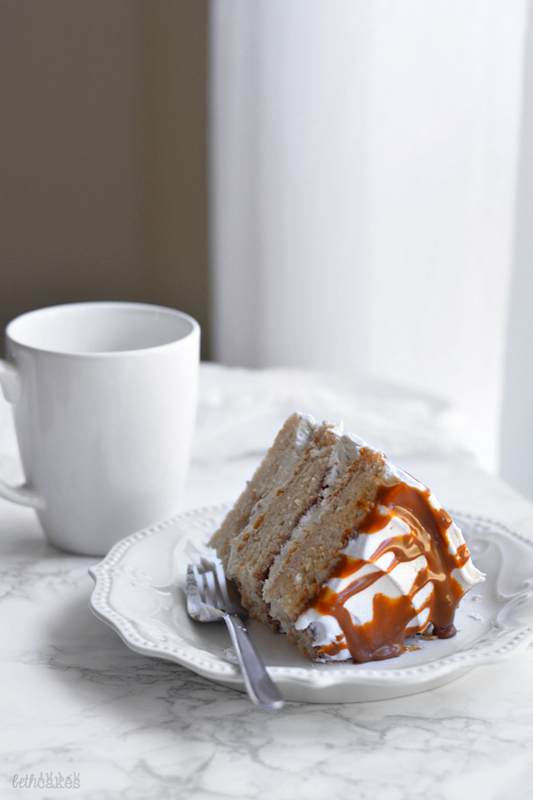 Spread 2 ½ tablespoons (38 ml) of cinnamon glaze over the cake layer. Allow it to soak into the cake. Spread 1 cup (284 g) of the cinnamon frosting in an even layer on top of the cake. Repeat this process with the second layer of cake, glaze and frosting, then add the final layer of cake on top. Drizzle cinnamon ganache over the cake. Store the cake at room temperature in an airtight container. 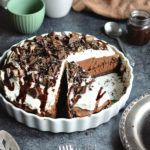 This cake is best eaten within 2 to 3 days. 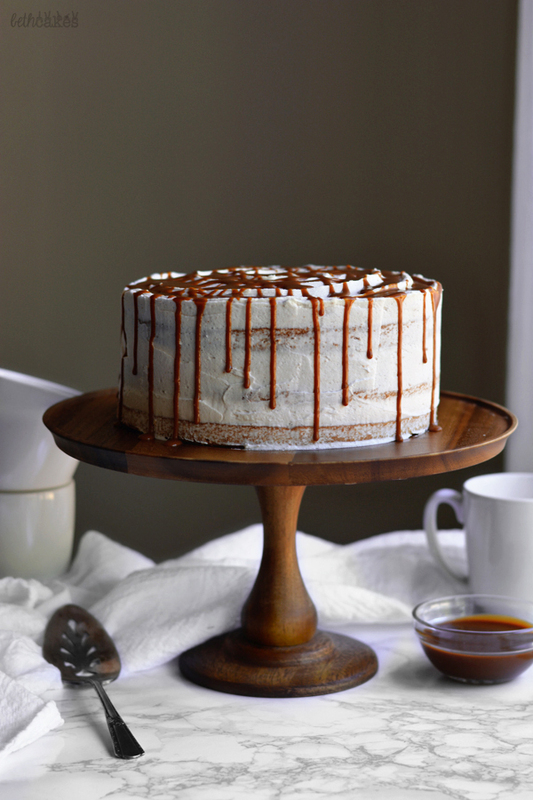 I obsess over all things cinnamon, and this cake is so spectacularly gorgeous, Beth! That roasted cinnamon sounds amazing – I must track some down. So beautiful. I’ve got to check out that book! Congrats to Lindsay on the new book and to Beth for baking such a delicious cake!